Justin completed his first triathlon in 2010 and joined the DC Triathlon Club the following year. 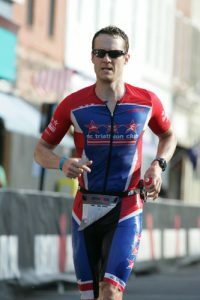 He has participated in the club’s Olympic Distance, Half Ironman, and Ironman programs. Justin credits these programs, fellow club members, and his current coach for his success in the sport. Justin joined the Elite Team in 2019 and enjoys racing all distances from sprint to Ironman. He has also served on the club’s Board of Directors since 2014. Athletic Background: Baseball and basketball through high school. All the intramural sports in college. Various other activities until I got hooked on triathlon. Goals for 2019: Stay healthy, stick to the training plan, and go fast. Favorite Places To Train: Skyline Drive or on trails at sunrise. Favorite thing when not swimming, biking, or running: Recovery? Fun Fact: I had only two wisdom teeth instead of four. Fav Race Distance: Too hard to choose – I enjoy all of them. 227 queries in 2.228 seconds.